The trip to Little River Canyon from my house involves a drive through profoundly rural areas of northeast Alabama and a few small towns and communities. It feels at times like time travel but it takes less than a couple of hours. The road passes the Paint Rock Valley before the backwaters of the Tennessee River and Guntersville Lake appear and then the town of Scottsboro. There, the Tennessee River is crossed and the road immediately climbs a steep grade to the top of Sand Mountain, a sprawling sandstone plateau near the southern end of the Appalachians. The myths, mysteries, and culture of Sand Mountain are legend in the rest of Alabama and I’ll admit that even though I have been to various parts of Sand Mountain several times and have been aware of it most of my life it remains a mystery to be unraveled for me. After driving across Sand Mountain, the road drops again to a valley containing I-59 and the town of Fort Payne. A quick ramble through Fort Payne leads to another steep climb to the top of Lookout Mountain. Little River in northeast Alabama mostly flows along the top of Lookout Mountain. This feature of the untamed river flowing along the mountain top is one of its most distinguishing characteristics. The canyon starts to form past DeSoto Falls at a wide plummeting Little River Falls and gets deeper, wider, and more steep as it moves down through the mountain. On a recent mid-May trip, the water level was fairly low but the sound of the rushing rapids could be heard from the west rim even when the lush green canopy made the river invisible far below. The canopy also helped to block the view of houses encroaching on the east rim. Since I was scoping out hiking trails for future trips, I mostly stayed on the Canyon Rim Drive which is part of the Little River Canyon National Preserve and meanders for eleven miles along the west rim. It passes a number of trailheads and provides a good opportunity to inspect the challenging terrain. Regular overlooks provide scenic views into and across the canyon. Trails afford steep access to the river and the canyon floor. Grace’s High Falls is visible across the canyon from an outlook on the drive. A dramatic 133-foot plunge during the rainy season, Grace’s High Falls was just a trickle during my recent visit. As the weather gets less humid it will dry up altogether. Canyon Rim Drive affords quick and easy access to the canyon’s majesty and mystique. A little farther upriver are an informative visitors’ center and DeSoto State Park with additional backcountry trails and accommodations. 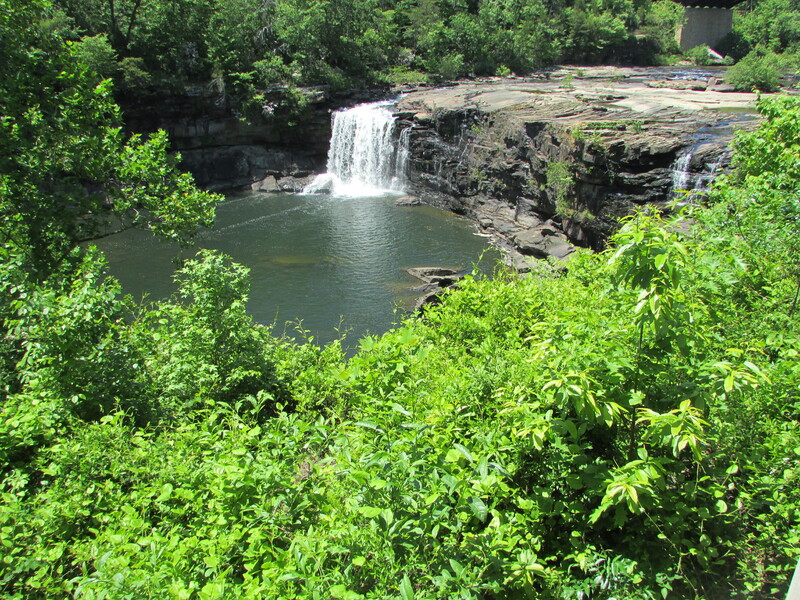 The National Park Service operates a boardwalk and trails on the east side of Little River Falls which provide access to the river and a close-up view of the falls. 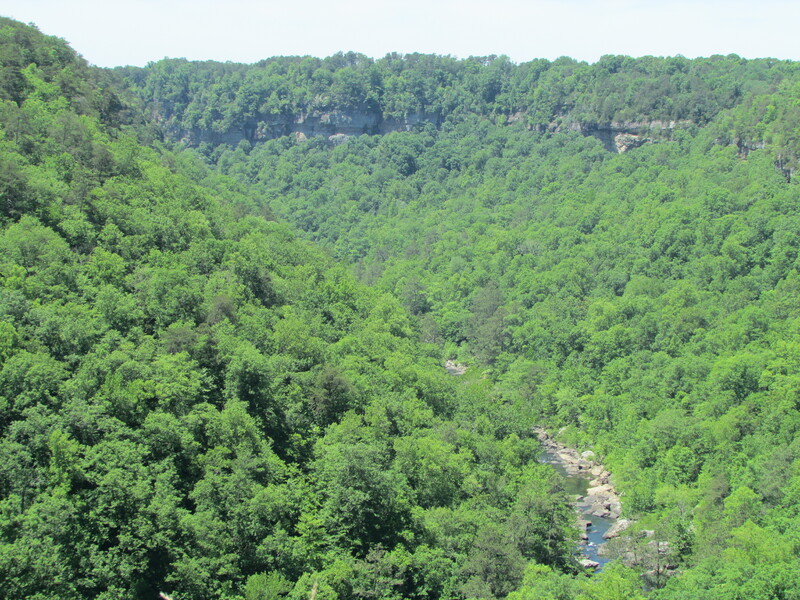 Little River Canyon is wild and feels extremely remote but it is actually centrally located in the region and only a couple of hours or less from Birmingham, Chattanooga, and Atlanta. A quest for this year is to continue to find great outdoor opportunities close to home. The bounty of Little River Canyon and the surrounding area definitely fits with that mission. 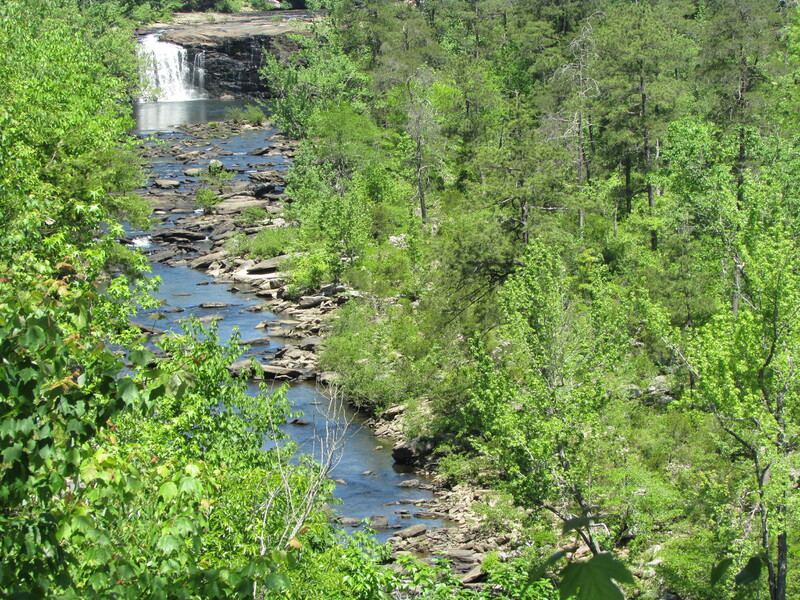 This entry was posted in Little River Canyon and tagged Alabama, DeSoto Falls State Park, Fort Payne (AL), Grace's High Falls, hiking Alabama, Little River Canyon (AL), Little River Canyon National Preserve, Lookout Mountain, Sand Mountain (AL), the south, travel on May 19, 2015 by gedwardjourney.